The story of a typical 13-year-old girl, Kayla, in her final weeks at a middle school in New York. She is lonely at school, being voted "Most Quiet in the Year", and struggles to connect with her awkward, single father. As a hobby she makes videos on YouTube about confidence and making friends, all of which get very few views. She struggles with anxiety when interacting with her classmates, even having a panic attack in the bathroom at a pool party. She is dealing with her first crush, with the cruelty of her classmates, and finally making friends with an older girl who is already in the high school to which she plans to move. The film shows the protagonist's struggle with friendships, family, and romance. 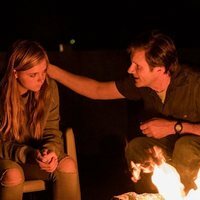 'Eighth Grade' Clip #2: "Different generations"
'Eighth Grade' Clip: "One more week"
Director Bo Burnham's idea was for the characters to communicate through Facebook. 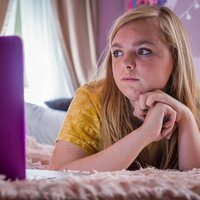 But when actress Elsie Fisher read the script, she said "no one uses Facebook", line that was used in the film and that made the characters change to communicate through Instagram and Snapchat instead. Barack Obama included it in his list of favourite films of 2018.